Americans are feeling the full weight of their precipitous financial situations – and it’s keeping them up at night. At least, that’s the findings of several recent studies about the prevalence and effects of financial stress from sea to shining sea. In fact, most of us have worried about money, mounting debt, and how we’re going to pay bills at some point, to the level that it’s been disruptive and caused significant stress. So, today we’ll examine on facts, stats, and data on financial stress in America, and remember that Roundleaf is here to help rid you from the shackles of debt and put you on a better financial path, stress-free! It may seem like we are wrapped up in arguing about politics, obsessed with our latest relationship (or lack thereof), or distracted by another disastrous season by our hometown sports team, but money is actually the root of all stress! According to a special report, Northwestern Mutual’s 2018 Planning & Progress Study, money is the absolute #1 cause of stress among Americans, with 44 percent of respondents reporting that finances cause them the most daily grief. In fact, that’s significantly higher than both the stress they report from personal relationships (25 percent) and work woes (18 percent). Our stress levels caused by finances are also getting much worse, according to the report. In 2017, 37 percent of U.S. respondents said that they felt moderate or high levels of anxiety when thinking about their retirement planning and savings. However, by 2018, that number had grown to 41 percent who were equally stressed about their retirement planning and 46 percent that were concerned they might outlive their savings – an alarming jump in just one year. The study went on to report that more than 25 percent of Americans sampled feel depressed on a monthly basis because of their finances or debt situations, with 41 percent even revealing that financial stress impacts their relationships with their spouse and family. Those findings mirror findings by the American Psychological Association, who cite money problems as the top cause of stress for U.S. residents today. In fact, the APA reports that more than three-fourths of Americans (76 percent) say that financial worries are their biggest stressor, again more than work, family, and health issues. Another independent health survey found that just within the last month, financial stress has made us feel irritable or angry (37 percent), nervous or anxious (35 percent), fatigued or overwhelmed (32 percent) and even depressed (32 percent). Stress also isn’t just an aggravated inconvenience but can cause serious health issues and even manifest physically instead of just psychologically. Financial stress not only keeps us up at night, but it also spills over into our workplace, resulting in lost wages and productivity. In fact, 28 percent of employees say that personal finance issues cause a distraction at work, and 83 percent of HR managers report that employee performance at work is affected by their money stressors. Data shows that women also feel more financial stress than men (approximately 15 percent higher), and Millennial experience higher levels of financial worry about a specific problem (student loans) than any other age group. However, there is a silver lining to all of this lamenting that we’re not carefree billionaires. In fact, the same Northwestern Mutual report found that a resounding 87 percent of respondents said that “nothing makes them happier” than knowing they have a solid plan to improve their finances. 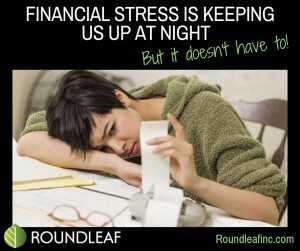 That’s why Roundleaf is here to help you eradicate your debt, fixing your budget woes and setting you on a better financial path to ease your financial stress. Please contact us to get started!